About 200 demonstrators with Palestinian flags took to central Berlin on Tuesday to vent their outrage at Washington’s decision to recognize Jerusalem as the capital of Israel. 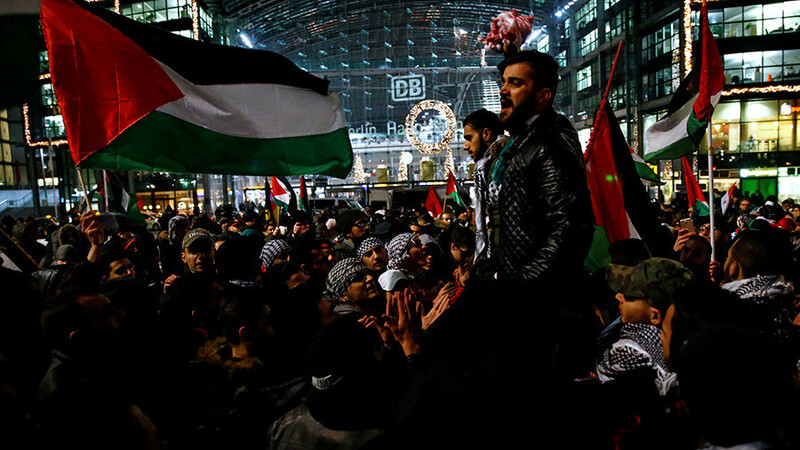 A wave of anti-Israeli protests has swept the German capital since then. Ahead of the protest, which took place in front of Berlin’s Central Station, police invoked a ban on burning any objects at the rally, meaning they would be able to intervene if anyone attempted to burn an Israeli flag, despite it not being an offence under German law. Flags have been burned at protests that have been gripping Berlin since Friday. After past rallies were marred with death threats towards Jews, police employed interpreters to help identify hate speech, Der Spiegel reports. There were some 400 officers deployed to the rally, double the number of the demonstrators, of which only 200 showed up despite organizers earlier announcing there would be some 500, according to Ruptly. In addition, the rally was moved away from the Pariser Platz in front of the US embassy to the central station, as it would have coincided with Hannukkah celebrations, involving the lighting of the first Hannukkah candle on the Europe’s largest menorah in front of the Brandenburg Gate. 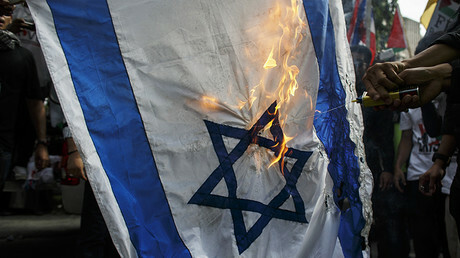 The anti-Israel and anti-US rallies, in particular the sight of Israeli flags being burned on German streets, prompted lawmakers across party lines to condemn protesters’ actions. That’s despite the German Criminal Code not listing the burning of flags, including the Israeli one, as an offense, unless the flag is used as a state emblem. It means that burning it is only punishable if it’s flown by the embassy or another government’s institution. DOES GOD FORBID A PALESTINIAN STATE?